Lejlighed med balkon med udsigt til en af ​​de pladser i Girona mest karismatiske. Smukt restaureret bygning i midten af ​​det største shoppingområde i den gamle bydel, hovedgade Mellem Rambla de Llibertat og Forca. Under renoveringen styre vi at bevare Kunne til gamle funktioner i den gamle bygning. De gamle stenvægge, den gamle facade med de smukke lofter og altaner. For at blokere ud til gaden støj muligt, har vi en særlig dobbelt glas installeret for at sikre dit velfortjent hvile om natten. Hver lejlighed har-blevet møbleret og indrettet med stor smag og øje for detaljer. De særlige LED-lys fremhæver de særlige funktioner og giver dig en varm og hyggelig følelse i lejligheden. Der er et soveværelse med dobbeltseng med en-suite badeværelse med bruseniche. Der er gratis wifi, vaskeri i hver badeværelse og et fuldt udstyret køkken. Vi er glade for at hjælpe med alt hvad du behøver. Vil du have en morgenmad tjeneste? Fra 10 euro pp, kan vi Organiser Personlig Morgenmad indkøbskurve for dig. Også, hvis du har brug for afhentning i lufthavnen eller ønsker at leje cykler eller gøre en bytur eller vin, kan vi arrangere alt dette for dig. Vi ønsker blot, at du har den bedst mulige ferie Organiseret, uden nogen bekymringer! Sen check in efter 20:00 vil blive opkrævet 30 € bonus. Du skal være opmærksom der vil NO blive tjekke ind efter 12:30 i nat. Ingen pelsklædte venner desværre tilladt, esta at Sørg allergi fri lejligheder til alle vores kunder. Nøglen pick up er på vores kontor i Carrer Bonaventura i Peralta 2. Hvis du har brug for en babyseng og høj stol, så lad os vide. Vi opkræver en ekstra 10 euro for hele opholdet, Dette omfatter strøelse til din lille en. We hebben een heerlijk verblijf in Gerona gehad. 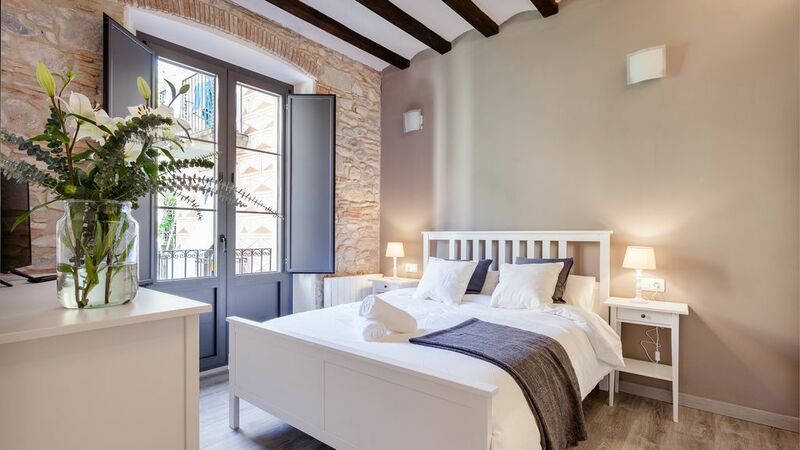 Het appartement ligt in het hartje van de oudstad van Girona en is de perfecte uitvalsbasis om Girona te verkennen. Het appartement is geheel gerenoveerd en gemoderniseerd en is modern ingericht en goed uitgerust. Het verhuurbureau is heel vriendelijk en flexibel met het maken van afspraken over betrekken en verlaten van het appartement. Enige nadeel was de bereikbaarheid met de auto. Je mag maximaal drie keer met de auto de oudstad in en je moet even weten hoe te rijden en waar te (even) parkeren. Rij je verkeerd, dan beland je in héle nauwe straatjes rond de kathedraal,...niet fijn! Dus vraag van tevoren even een plattegrond met instructies. Verder een heerlijk verblijf gehad!!! Die Wohnung entspricht den Abbildungen in allen Punkten. Sie ist mitten in der Altstadt, alles ist zu Fuß zu erreichen. Durch die Doppelverglasung an den Balkontüren kann man ungestört ausschlafen, ohne von dem regen Treiben gestört zu werden. Beim nächten Girona-Besuch werden wir sehr gerne wieder diese Wohnung mieten. Great place to stay in the old town. We arrived by taxi and were met as we got out. Had to walk a short block because cars are not allowed in the area. In fact a car is more trouble that it is worth. There is limited parking close by. And you can walk to many sites and restaurants in 5 minutes. The unit had all we needed for our stay. It is on the 6th floor so it is well above the noise of the street. (There is a lift.) Nice and quite for sleeping. Would recommend for a couple. When I booked this stay, I never imagined this remodeled home would be right in the heart of the old city of Girona. What a wonderful experience to be so close to the history of the city and to be able to be part of the daily heartbeat. Andrea was wonderful. It was late in the evening when she met us with a smile and such enthusiasm for her adopted city and her job. We loved the apartment. It was perfect for the 3 of us. Even the walk with luggage and the walk to the lot where we parked didn't spoil the experience. We were thankful for the elevator, however small. We appreciated the air conditioner and the washer and dryer. It was a great place to come home to at the end of each full day of exploring. Waking up with the bustle of the city was also enjoyable. The doors/window shutters on the balconies kept the apartment very quiet. Except for the jack hammers the day the water mains were being worked on, we had no noise. I would certainly recommend this place and this company, Owners Direct, to anyone traveling on their own (without a tour guide). It was so easy to find the perfect property for our needs and to be assured before leaving home and along the way that you were looking out for our stay to be the best it could be---and it was. Thank you. We are three Canadian university professors travelling after an international symposium in Barcelona. The apartment is ideally located for exploring old Girona. Parking is not permitted in the old sector, but there is free public parking just across the river. You can drive into the old city for unloading and loading luggage. The apartment is well-appointed, air-conditioned, and very comfortable.The folks at Sleep & Stay were extremely helpful, including offering discounts at several restaurants. We enjoyed fabulous breakfasts at Federal Cafe (10 metres from the apartment) and La Fabrica. A highlight of our visit was dinner at Arros I Peix, where diners get to select the seafood from a 'market' in the restaurant and it is prepared to your specifications. A walk along the city wall, a visit to the Jewish museum, poking around the streets in the Jewish quarter, seeing the Cathedral, the Basilica, and the Art Museum... 2-3 days are a minimum for exploring this extraordinary Medieval town.